Crowdmaps is an app that will make easy and accessible to non-tech savvy users to create, collaborate and share geographic information. A necessary tool for ONG's and Communities that will help them to get into action obtaining intelligence from geographical data in a sustainable way. Every ONG, community or individual trying to do a positive change will probably say "there is no enough information about migration, about poverty, about X...". The opendata movement is trying hard to make GOB give access to the public important data that will be useful or more certainly decisive to fix social problems. But the GOB is the only datastore? What about my neighbors, my family, my coworkers, what about social movements, teens, workers, migrants, what about Us? Crowdmaps is about recognizing US as data providers, that we collectively can create intelligence and success doing a social change. Crowdmaps statement is everyone is consumer and producer of data, and we can all collectively help each other to understand better social problems by providing our facts, experiences and knowledge opening our data to the world. Where? is a constant question for activist that try hard to do a positive impact on the migrant problems. Discrimination, Violence, Humans Right, Poverty, Underdevelopment there are many issues and many ways to address migration, as a problem or as solution. Geographic information is important for creating social change, you want to know, where are the subjects you are trying to help, if you keep asking every day Where?, you will certainly start searching for a Map. But Where do I find that Map? 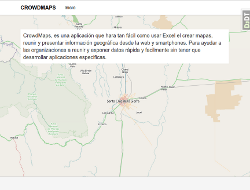 That is how Crowdmaps tries to help, making it easy to gather and process geographical data, using collaboration, sharing and open catalogs so any person can start getting intelligence trough the data analysis, they can reuse data from other persons or organizations, and decide to work public or privately. Help Individuals to access intelligence, and help organizations to socialize geographical data. We are building a website that will make it easy as using the web, to create, share and collaborate in maps. Adding points, lines, polygons are just the essentials, what we are going to aspire is to build a community of producers. I'm a migrant in New York, Where can i find dentists that speaks Spanish? I'm a ONG, I need to know where are migrant communities, where do I find them? I know it exist a common route for human traffic in my city, how can I start research? where can I find persons that will help me to do that? Where in Buenos Aires can I find work for just one night? Where are the danger zones to live? What are the prices of the living in each zone of this city? I'm the GOB and we have extensive social data, but we don't easily find people doing research with this, we need researchers that work with our data. We are small government agencies, we cannot afford have Geographical integrated systems to process data or publish, what can we do? @mariocesar: We have our first deployable view, here is how it looks in the dev.